A coach from Malaysia recently emailed me asking about foot strike & I fished up an answer from my FAQ file. Thought I'd share it with you all today. Let me start of by making it clear that I do not advocate either mid foot, heel 1st, whole foot or toe (ballet anyone?) running. I prefer to see what the runner currently does, what success they are having & what their injury profile is. Then I might suggest actions that increase performance, but at the same time reduce the incidence of injury. 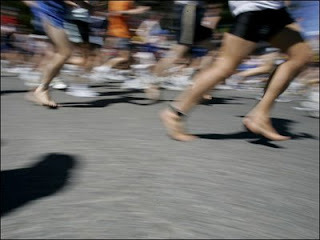 Every runner has a “natural” way of placing their foot on the ground. Some place, some drop & how this came about is as a result of many things. Most hit heel 1st & this is fine & preferred by most PTs as it has the least probability of injuries. The only key with heel strike is that the foot contacts the ground almost below the hips & that the toe is not too high off the ground (fore foot should be on the ground very quickly after the heel strikes the ground – the shin should not have to work too hard to decelerate the fore foot as it is lowered to the surface). If there is a 2 beat foot strike - heel, then mid foot, the toe is up too high. The foot should form a partial wheel when heel striking & roll from heel to toe with no significant pause at heel strike. Striking on the outside of the mid foot (lateral) is also effective & considered a more elite foot strike as displayed by many top Kenyan, Ethiopian & other African runners. As long as the heel settles onto the ground soon after as it loads & then toes off. Sebastian Coe speaks of the heel kissing the ground. Toe off is an elastic release, not a push off. This is probably preferable from a performance stand point, but remember many elite runners are still heel strikers & do just fine. A full forefoot strike that has the heel off the surface throughout the support phase till toe off is not recommended (i.e. the heel never touches the ground). Some folk can do this for shorter distances – like sprinters, but it carries a higher risk of injury, is strength predicated & ultimately much more fatiguing. This is not good at all for triathletes as they are already too fatigued here after the bike. Apparently about 85% of runners are heel strikers, but none of the greats run this way - they land mid foot & the heel touches the surface at mid stance.